A stunted twenty miles. That’s the distance between Everglades and Biscayne National Parks. A thirty-five minute drive that captures the multifarious essence of the southern tip of Florida. Tourist attractions beckon with promises of wildlife and key lime shakes. Small towns offer up homemade pies and tacos, while sprawling shopping malls cling barnacle-like to freeway exits. Broad expanses of open sky meeting farmland, suddenly give way to block cement homes and children playing on thirsty lawns. It’s a dizzying array of people, cars, shops, traffic signals and blacktop. I made this trip three times. Always aware of the incongruence of where I’ve been, where I’m going and where I am. VIEW FROM THE SMALL PARK DIRECTLY IN FRONT OF THE BISCAYNE VISITOR’S CENTER. 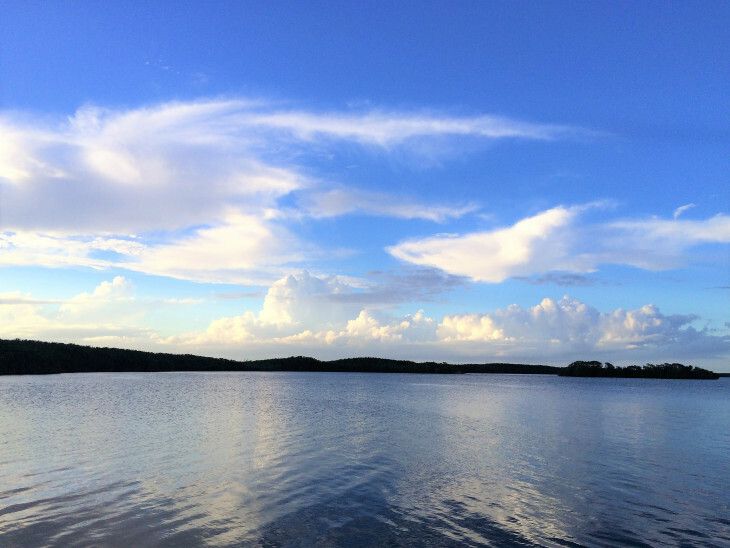 I SAT HERE ONE EVENING UNTIL THE SUN WENT DOWN AND THEN MADE MY WAY BACK TO THE EVERGLADES. THE BOARDWALK ADJACENT TO BISCAYNE’S VISITOR CENTER WEAVES IN AND OUT OF MANGROVE STANDS. ONE OF MY PROUDEST MOMENTS. THEY LET ME WEAR THE RANGER HAT. I ASKED IF I COULD BUY IT AND THEY POLITELY TOLD ME – IN SO MANY WORDS – THAT I WAS NOT THAT BRIGHT AND NO. I have a friend that loves to kayak. She has sent me several photos of her feet in a kayak to prove it. No photos of her actually in a kayak mind you – just her feet. Yes, I find it oddly suspicious as well. In any case, I have kayaked many times on the Great Lakes, but this would be a first in the Atlantic. Since I am traveling alone, the thought has occurred to me once or twice, what would happen if I get in trouble? What if the Canadian wolf in Pukaskwa National Park had paid me another visit? (Answer: I would have wrestled him to the ground and he would now be traveling with me as a pet.) What if the wind blew me over the edge at Meat Cove? (Answer: I miraculously would have managed to grab the only branch on the side of the cliff that would hold my weight.) What if I tripped walking into Walgreens? (Answer: I would have broken both hips and my left kneecap.) So on this occasion I wondered what would happen if by some odd occurrence I rolled the kayak and got stuck underwater? (Answer: I envisioned several chubby fish, bubbles frantically reaching for the surface as they gathered to push me upright. “On three…get over here groupers. Bob, get the groupers.”) As it turned out this was needless worry. My ride along the edge of the mangroves was in shallow water. I know this because after 45 minutes of gliding along the bay, my kayak jarringly hit bottom and stayed there. At this point I should have taken a photo of my feet. Instead I stepped out and awkwardly fell in the water. I’m fine. TANGLED ROOTS OF THE MANGROVES. THIS IS PRETTY CLOSE TO WHERE I RAN AGROUND AND TEETERED FOR A WHILE BEFORE FALLING. NOT ONE OF MY PROUDER MOMENTS. Heading across SW 344 street, I found Sir Woody. He was standing beside the road in front of a large cast iron double smoker. I pulled over, walked up and asked him what he was cooking. “Ribs. But I’ve been doing turkeys all morning. You need a turkey for tomorrow?” No. I’m good. But I would love some ribs. “Whole slab?” No, just a sandwich. “Sandwich? I don’t make sandwiches. Where you from?” Michigan. “I’m Woody. Sir Woody to my friends.” I’m Smitty. How many turkeys have you smoked for Thanksgiving? “Oh, I got a trailer full. Come on in and take a look.” He turned and opened the door to a small trailer, with barely enough room for two people. But there was room for a chopping block stacked with ribs, a fridge and lots and lots of perfectly smoked turkeys. “I smoked all these for one guy. Come here every year and buys about twenty big birds for his employees. Pickin em up tomorrow.” Damn those look good Woody. “I been smokin meat for most my life. Here, try a piece of these ribs. Just cooked a while ago. You like barbecue sauce?” Before I could answer he picked up an old squeeze bottle and slathered the ribs. “I make this myself. Whatcha think?” I couldn’t speak. I had entered a state of nirvana and my tiny brain collapsed on itself. Somehow I managed to nod and wink without breaking down in tears of joy. Woody just laughed. A good genuine laugh. “Come on back outside and I’ll give you some right out the smoker.” Still speechless I followed – gnawing on a bone as if God had spoken directly to me and said this is your last meal on earth. As we walked out of the trailer, a woman and two young girls came running up to Woody. “This is my daughter and her two girls. Just out of school for the day. Say hello to Smitty.” I shook the woman’s hand and asked the girls if they liked school. “Yes” they said in unison. That’s good. Stay in school. “Oh, they staying in school” said Woody. “No other way to go. Right girls?” “Right Grandpa.” Well you girls be good. It was nice meeting you ma’am. Woody, I can’t thank you enough for the tour and the ribs. “Sir Woody. My pleasure Smitty.” As I drove away I knew I had just met a man content with life. Sir Woody. If I ever figure it out – I’m closer today than I was yesterday – I’m going to start calling myself Sir Smitty. Sir Woody to his friends. During the 1950’s, as Americans prospered and Florida became a popular destination, more and more northern ‘snowbirds’ flocked to the calm waters of Biscayne. They found tranquil waters, unsoiled by the progress of man. In the 1960’s Biscayne was given a death sentence as developers, kings of discovering the unspoiled, submitted plans to build condominiums and resorts along the bay. The proposal called for the dredging of a 40-foot deep channel through the bay’s clear, shallow waters. Blueprints for Dade County’s ‘New Frontier” included the City of Islandia and Seadade, a major industrial seaport. It was then that a few locals who understood relatively new concepts like ecology and environmental preservation, got involved. And for a while it was ugly. THE INFAMOUS LIGHTHOUSE THAT MR. HONEYWELL BUILT. I AM GOING TO CONTINUE TO WORK HARD, BUY A KEY AND INVITE ALL OF MY FRIENDS TO VISIT. IT WILL BE GLORIOUS. YOU’RE ALL INVITED. Twenty five people board the boat for a 45 minute ride across the bay to Boca Chita Key, the northernmost key in the park. I am the last to board and find myself sitting next to the pilot, a woman who has clearly seen the sun on most days. She is weathered, but gracefully so. She is also cheery, a personality type that I struggle with. What do they know that I don’t? Or what don’t they know that I do? In any case, the cheeriness never wears off on me. Not that I’m drab mind you. I dare say most people find me pleasant. Like the guy who sells you a burial plot. As we slowly glide out into the shimmering turquoise channel, our guide – who is considerably less cheery – begins to tell us about the vast diversity of wildlife in the bay. Over the drone of twin engines, I hear “yellow snapper, Nassau grouper, queen angelfish.” Something about “soft coral.” I am in the wrong seat. “Brown pelicans, pie-billed grebe” (did I hear that right? ), “Audubon’s Shearwater and buffleheads” (now I think he’s just messing with us). 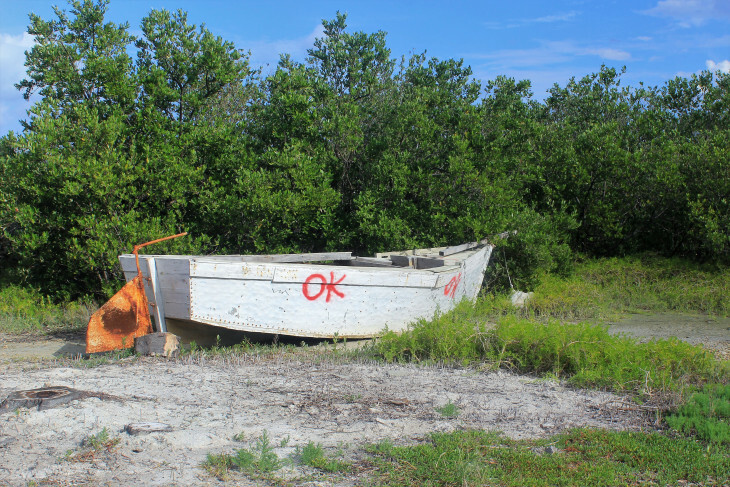 “To the right is Elliott Key, the largest key in Biscayne National Park.” We have powered back the engines and are now drifting along the mangrove riddled shoreline. “Black mangroves reside in mostly salty, silty, saturated soils found along the tidal shoreline. It prefers higher and dryer soils than the red mangrove. White mangroves can be found inland.” As we gather speed and return to deeper, darker blue waters, I’m still wondering if a bufflehead is a real bird. STAIRCASE LEADING TO THE LIGHTHOUSE OBSERVATION TOWER. CANT’T CLIMB WITHOUT THINKING OF A BUTTON SEA SHELL. OR ALFRED HITCHCOCK. While docking, our guide launches into a brief history of the man who built a home and lighthouse on the key. In the 1930’s, Mark Honeywell, founder of Honeywell Corporation, purchased Boca Chita and built several stone structures, including a home and lighthouse. As if buying a key wasn’t extravagant enough, Mr. Honeywell also decided to build his lighthouse on the bay side of the key so that his friends in Miami could see the beacon and know when he and his wife were in residence. Naturally the Coast Guard objected to a lighthouse that would guide ships from the Atlantic into the reef and Mr. Honeywell was not allowed to ever turn it on. This did nothing to deter Carl Fisher, a wealthy entrepreneur, from sailing over to any of several soirees, along with his famous pet elephant, Rosy. The same Rosy who later gained fame for serving as President Herbert Hoover’s golf caddy when he came to Miami. My uncle claims knew the guy that followed the elephant. As fate would have it, in 1939 Mr. Honeywell’s wife tragically died in what was officially listed as a boating accident. At the time rumors flew that she was pushed overboard by her husband. Regardless of the truth, Mr. Honeywell sold the island claiming that without his true love, the island became a painful reminder of what he had lost. I want to believe it was an accident. Because I believe that true love lost is far worse than never knowing what true love is. For only after knowing the joy of true love – deep, honest, unyeilding, embracing, unconditional, physical gut-punching love – can you experience its bottomless chasm of loss. I would have given it away. Heading away from the dock, a short trail loops past the old stone ruins of Mr. Honeywell’s dream and into thick vegetation. Two boats lie broken, at rest in the sun. Breaks in the foliage give small glimpses of the bay and the cloud covered waters of ever changing color. As you come to the end of the trail, a small sandy beach lies directly ahead. Standing at the water’s edge, looking out at lonely mangrove stands dotting the sand, I am the only person on earth. I am the only man standing in these waters, eyes fixed on the blue-green stripes of the ocean. I am the only one seeing the African born waves, finding the shore before retreating back to sea. I turn to see if anyone is nearby. I reach for the hand I long to hold and tell myself I am not alone. Photo taken by a young park volunteer, originally from Cody, Wyoming. Her husband worked as a Park Ranger and had recently been transferred from Great Smoky NP. Looking northwest from the lighthouse. A series of small islands and Miami, 16.5 miles away on the distant horizon. MIAMI WITH A LONG LENS FROM FROM THE LIGHTHOUSE ON BOCA CHITA KEY. IT SHIMMERED IN THE DISTANCE OZ-LIKE, RADIATING A SILVER TINTED BLUE. I’M PRETTY SURE I COULD SMELL A GOOD CUBAN SANDWICH. I’VE MADE THEM AN OFFER. SHOULD GET THE RETURN PHONE CALL ANY DAY. THE EASTERN EDGE OF BOCA CHITA KEY. A SERIES OF STORM CLOUDS BRUSHED UP AGAINST US, BUT NEVER OPENED. YET SOMEHOW A RAINBOW APPEARED. COINCIDENCE? I THINK NOT MY FRIEND.